Santa Anita has canceled racing indefinitely to re-examine its dirt surface after the deaths of 21 horses in the last two months. "In whole, we feel confident in the track and we're just being very proactive," Ritvo said. "We want to do all the testing that needs to be done. When we believe we're in good shape, we'll start to train over it again." "Obviously, one horse is too many," Ritvo said. "The recent rash is just horrible. We need to definitely take a step back and evaluate everything." Santa Anita received 11½ inches of rain and had unusually cold temperatures in February, but it's unclear whether track conditions played a role in any of the fatalities. The National Weather Service was forecasting 1 to 2 inches of rain in Los Angeles County starting overnight Tuesday and into Wednesday. "We think that (rain) could definitely contribute even though our experts are telling us not," Ritvo said. "The tracks out here are built not for weather like that." 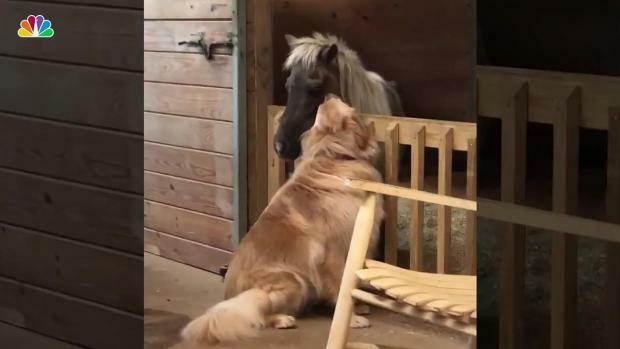 Molly the 3-year-old golden retriever lives at an equine rescue in North Carolina where she particularly loves the miniature ponies because she can reach them easier. When Sammi the horse arrived at the rescue she was "skin and bones and scared." But with the help of Molly, who formed a special bond with him, the pony is healing and has turned into a "love bug." Ritvo said officials are "a little bit concerned" with the latest impending storm and how the dirt surface can change from muddy to fast in a short time. Besides re-examining the dirt track, Ritvo said all racing protocols would be looked at. "We won't rush it," he said. "Everybody takes a deep breath." "Those are huge races," he said. "We hope so." Seven deaths have occurred during races on the dirt oval at Santa Anita since the track's winter meet began on Dec. 26. Five have occurred on the turf course and nine came during training on dirt. The highest-profile horse to be euthanized was Battle of Midway, winner of the 2017 Breeders' Cup Dirt Mile. The 5-year-old bay also finished third in the 2017 Kentucky Derby for Hall of Fame trainer Jerry Hollendorfer. 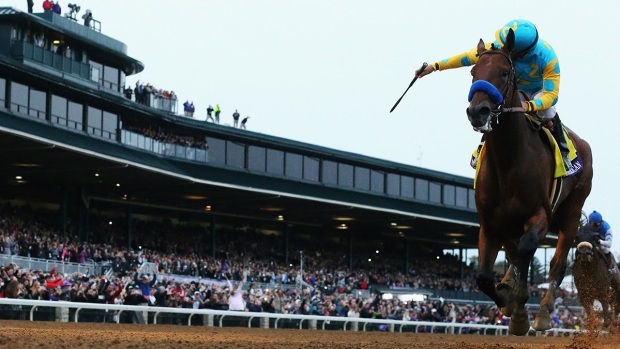 The horse suffered injuries during a workout on Feb. 23. Victor Espinoza won the elusive Triple Crown of horse racing in 2015. Find out how he stays fit and why, for jockeys, there is no offseason. Hall of Fame trainer Ron McAnally said 4-year-old filly Lets Light the Way "took a bad step or something" on Tuesday. "I think the weather has a lot to do with it," said McAnally, whose wife, Debbie, owned the filly. "Santa Anita has been a wonderful track, and they've done all kinds of tests," McAnally said. "I don't know what else they could do. It's a fluky thing." Also Tuesday, Vyjack was pulled up after completing a five-furlong workout, according to trainer Phil D'Amato. The graded stakes-winning 9-year-old gelding was taken off the track in a van. But D'Amato told the Daily Racing Form that Vyjack "took a couple of funny steps" and was OK. 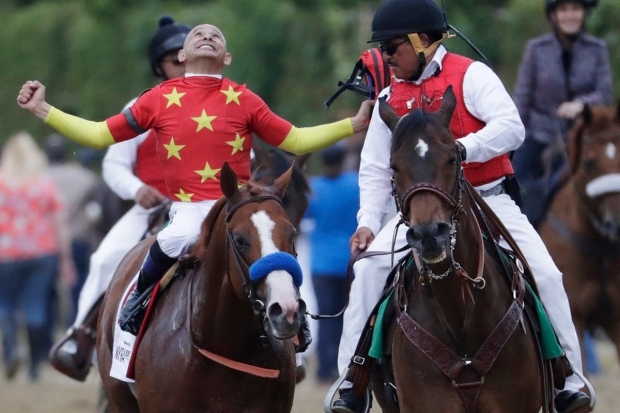 Justify cemented his place in history with a Triple Crown win at Belmont Stakes. "This was the right thing to do," she said in a statement. "The track should remain closed until the California Horse Racing Board dumps the drugs entirely, or injured horses whose soreness is masked by legally allowed medication will continue to sustain shattered bones. 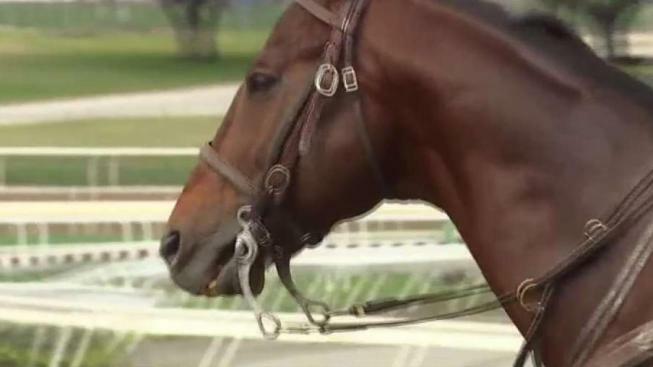 PETA renews its call for a criminal investigation into the trainers and veterinarians who may have put injured horses on the track, leading to their deaths." Ritvo said, "The first and most important thing is the health and welfare of the horses and jockeys." In 2017, 20 deaths occurred among a total of 8,463 starts over a span of 122 racing days at Santa Anita, according to the most recent figures compiled by The Jockey Club. That's a rate of 2.36 deaths per 1,000 starts. There were 1.61 deaths per 1,000 starts in the U.S. in 2017, according to the most recent figures from the Equine Injury Database, compiled by The Jockey Club. That was a slight increase in the rate of fatal injury compared with 2016, when there were 1.54 deaths per 1,000 starts. Not sure how to bet on a horse race? Here’s some advice for first-time bettors. The deaths were more frequent on dirt surfaces (1.74 per 1,000 starts) than on turf (1.36). Santa Anita was closed for two days last week while the dirt surface was tested. Mick Peterson, a soil and safety expert brought in from the University of Kentucky, proclaimed the track "100 percent ready" to resume racing. Peterson said radar verified that all of the silt, clay and sand, as well as the moisture content, were consistent throughout the track. Its dirt surface was peeled back 5 inches and reapplied. For the last four years, Luis Grandison has been the only full-time Spanish language horse race narrator in the U.S. The other death occurred Saturday during the third race when 4-year-old filly Eskenforadrink was in the lead. Jockey Geovanni Franco pulled her up with an injury to her front leg. The filly was taken off the track and was later euthanized. Track officials announced Tuesday that a former track superintendent is returning immediately to Santa Anita as a consultant on site as "a precautionary measure with regard to the condition of the one-mile main track." The consultant, Dennis Moore, worked in Arcadia from 2014 until retiring Dec. 31. He currently holds the same position at Del Mar and Los Alamitos racetrack in Orange County.